Dr. Watins specializes in stress-related problems such as headaches, neck pain and lower back pain. He has worked with many Fortune 500 companies in the New York City area, administering the highest quality of chiropractic care. He has treated performers, athletes and CEO’s of some of the world’s largest companies. Dr. Watins’ full service chiropractic office utilizes diversified chiropractic adjustments as well as gentle light force adjusting. We focus on strengthening programs, postural correction, ergonomics and flexibility. Utilizing various physical modalities, we specialize in treating a variety of conditions from chronic back and neck pain to sports injuries and rehabilitation following an accident or injury. We provide information to improve the overall quality of your life. Dr. Michael Watins graduated from the University of Maryland and obtained his Chiropractic degree from the prestigious New York Chiropractic College. Dr. Michael Watins started West Side Comprehensive Chiropractic in 1994. He graduated from the University of Maryland and obtained his Chiropractic degree from the prestigious New York Chiropractic College. Dr. Michael Watins attended the University of Maryland, where he studied Pre-Med and graduated with a Bachelor of Science degree. He then attended New York Chiropractic College, where he received his Doctor of Chiropractic degree. Dr. Watins has completed extensive post-graduate study emphasizing the treatment and rehabilitation of sports injuries, posture, ergonomic related conditions, headaches, neck pain, back pain, Graston technique, Functional movement screen, Selective functional movement screen, Active Release Technique (ART) and radiology. Dr. Watins specializes in stress-related problems such as headaches, neck pain and lower back pain. He has worked with many Fortune 500 companies in the New York City area, administering the highest quality of chiropractic care. Dr. Lewis went to the State University of New York at Binghamton where he graduated with a Bachelor of Science in Integrative Neuroscience. He obtained his Chiropractic degree from New York Chiropractic College and simultaneously obtained his masters degree in Applied Clinical Nutrition. He is full body certified in Active Release Technique, certified in Kinesio Taping and received an advanced certification in Sports Science and Human Performance. He has been affiliated in the CUNY system as a team doctor and has treated countless athletes and performers to enhance their bodies to allow them to participate at an elite level. Dr. Esposito has been in private practice for over 16 years and currently performs EMG/NCV evaluations at several medical centers throughout NY. Dr. Esposito holds a current faulty position with American Academy of Clinical Electodiagnosis in which he is both a lecturer/ case study reviewer and a laboratory instructor. 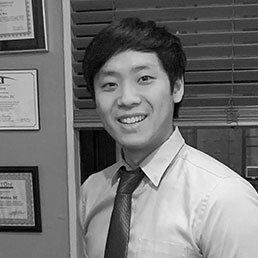 Dr. Park was raised in Plainview, New York and began to develop his career at SUNY Stony Brook where he obtained his Bachelor of Science Degree in Health Science. He received his doctor of chiropractic degree in New York Chiropractic College where he graduated with honors and as a member of Phi Chi Omega honors society. He is a licensed professional to serve and help the community by relieving musculoskeletal imbalances and restore functionality. Dr. Park concentrates his focus in treating headaches, neck, and low back discomforts with more gentle and specific approach with various chiropractic techniques such as diversified and instruments assisted adjustments, flexion-distraction, ischemic compression and deep soft issue techniques. Dr. Park had treated a variety of patients with different backgrounds and prescribes exercises according to different conditions. As an avid swimmer and rock climber, Dr. Park stays active to enhance his endurance to help many individuals as possible. As a native Korean, Dr. Park is fluent in both Korean and English. There is a large degree of misunderstanding regarding what chiropractic can and cannot do/treat. Therefore as a whole the population vastly underutilizes and falls to take advantage of the conservative drugless treatment options that this field offers. Our office renders treatment options and other services in accordance with the latest research and trends that exist in the chiropractic, physical rehab and injury prevention venues in regards to conservative and cutting edge care. Many, if not most people can avoid long term prescription medication treatments as well as surgery by utilizing conservative methods; however, there still exists many misconceptions and fear. Our office treats diverse aspects of the population from performers, dancers, professional athletes and non-professional athletes that compete in marathons, triathlons, iron man competitions, etc. We also cater to people that sit at computers, people who are sedentary and deconditioned. We often see patients suffering with severe problems such as multiple disc herniations and we have specific treatment programs to manage these conditions among others without surgery. In our efforts to meet every patient’s diverse and specific needs, we utilize the most up-to-date treatment protocols that incorporate ergonomic and injury prevention. We utilize standard yet diverse assortment of adjusting techniques that are suited to the patients needs. As opposed to those offices that ‘specialize’ in only one treatment, we utilize treatment or adjusting procedure that will most likely have the desired benefit by progressive contemporary trainings allowing us to offer many various treatments and these recent advances in terms of treatment are constantly incorporated into our practice. Techniques such as Gaston, Functional Movement Screen (FMS), and functional rehab are some examples of advances in treatment of musculoskeletal injuries. These are techniques that are now used by many, if not all professional athletes, including the Olympic athletes. We strongly believe the care of the patient should start with the most conservative care and least invasive care first. If needed medication should be the secondary option and surgery should always be the last resort. There are many studies that indicate that approximately 50 percent of all health problems are due to environmental factors. These factors are in the patients control and as such often require the patient’s assistance to get the best result possible. The goal being greater than ‘just’ pain relief that is temporary but to address the patients entire health care needs and to come up with a plan and educate the patient so that they can take a proactive approach to their health so that they not only feel better but become healthier and reduce the risk of health problems down the road. Over the years our office has adapted so that we cater to the needs of the diverse population of patients that we serve in the office. As a result, we treat far more than just the back, neck, and headaches but most any problem that is neuromuscular and/or functional in nature. In the over one hundred years of its development, Chiropractic science has grown to major stature in the field of the healing arts and has reached millions of people. Today’s Chiropractor works both directly and indirectly with the nervous system. Every organ, tissue, and cell is controlled by nerve impulses traveling from the brain to all parts of the body. Nerves make possible all sight, smell, taste, touch and hearing. Nerves maintain balance and keep the body temperature at 98.6. Nerves make it possible to swallow. Nerves make the bowels move. Nerves control the liver, lungs, spleen, pancreas, gall bladder, and kidneys. In fact, the nervous system is the master system which controls all other systems of the body, including: the glandular, reproductive, digestive, eliminative, respiratory, and circulatory. Every science of healing has what is known as an avenue of approach. For example, in the field of medicine, a hypodermic needle injects drugs through the skin; a pill is swallowed and goes into the stomach. These are the avenues through which the drugs gain access to the body. In the field of chiropractic, the avenue of approach is the spine. The spine houses and protects the spinal cord, the switchboard of the nervous system through which nerve fibers pass from the brain to different parts of the body. For every effect there must have been a cause. If a person is ill, then the condition of pain, regardless of the name applied to it, is an effect for which there must have been a cause. The nerves leave the spinal cord through openings between movable spinal bones called vertebrae. When vertebrae through injury or posture problems become dysfunctional, they interfere with the normal function of these nerves. This joint dysfunction causes pain and malfunctions of the nervous system and is called the vertebrae subluxation complex. The objective of chiropractic care is to determine, through x-ray films and thorough examination, the degree of the vertebral subluxation complex. Proper adjustments are given to reduce the cause of pain and malfunction. The result is optimal physical and mental performance.